Went for a night ski at Hammond Hill. Excellent conditions. Abs, core and shoulder workout in the afternoon. Then two hours of skiing. Followed by crack training at Lindseth. And then a movie at 504. Good day! 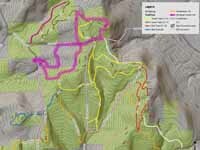 The Blue Trails are 1.4 miles in length. The recreational activities allowed on the blue trails are hiking, mountain biking, horseback riding and cross-country skiing. The Yellow Trails total 5.6 miles in length. The recreational activities allowed on the yellow trails are hiking, mountain biking, horseback riding and cross-country skiing. The Red Trails are 1.7 miles in length. The recreational activities allowed on the red trails are hiking, mountain biking, horseback riding and cross-country skiing. 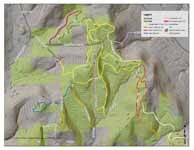 The Green Trails are 1.7 miles in length. The recreational activities allowed on the green trails are hiking, mountain biking, horseback riding and cross-country skiing. Orange/Snowmobile Trails are 5.6 miles in length. The trails are designated as a corridor snowmobile trail. However, other recreational activities allowed on the orange trails are hiking, mountain biking, horseback riding and some cross-country skiing. The Finger Lakes Hiking Trail (FLT) section on Hammond Hill is approximately 3.2 miles in length and signed with white blazes. Recreational activities allowed on the trail are hiking during the summer and skiing and snowshoeing during the winter.